The first Christmas comes and goes, and most people don’t notice. Mary, Joseph, the shepherds, and a few others catch a glimpse of what is happening, but they’re just a handful. Bethlehem is so crowded that the hope of the world is born, and most miss it. The holy family, who would not have referred to themselves as the holy family, goes to Jerusalem for the baby’s dedication. The shepherds, angels, and heavenly hosts are long gone. Mary and Joseph have been left with a son to raise. Jesus is two months old, still keeping them up at night. 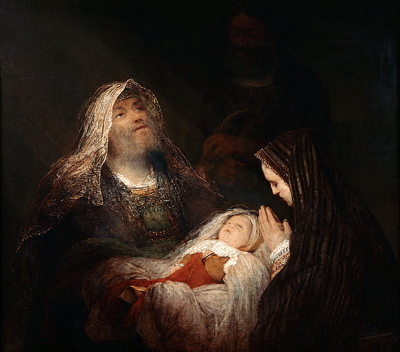 With both hope and helplessness, Mary and Joseph carry their tiny stranger through the temple. When it’s her turn, Mary steps forward, presenting her child to be blessed by the ancient rabbi. Then Simeon looks at Jesus, and his heart begins to race. He knows. He is not sure if he should laugh or cry. “May I hold the baby?” he asks Mary, trembling as he holds out his arms. Imagine expecting “gitchy gitchy goo” and getting “This child will be the light of revelation for all people.” Joseph is tongue-tied. Mary does not know how to take the part about her heart being pierced with a sword. The two of them spend the rest of their days not quite sure how to respond. Simeon does not understand everything either, but he knows hope when he sees it. We are usually too distracted to recognize God’s presence. We spend most days preparing for the next day, treating our present circumstances as stepping stones. But this place and this hour are the only place and hour available in which we can make a place for God. The sacred wish at the depths of our hearts, the wondrous hope that we rarely think about, is God with us. At the Lord’s table, we glimpse our salvation. The supper is an opportunity to recognize God’s presence and give ourselves over to hope.